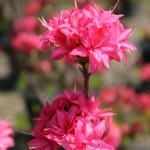 Bright, bubblegum pink semi-double flowers, uniquely display their pointed petals in tight, ball-shaped trusses. The blooms appear in mid-season. The form is upright and open. Prune after flowering as needed. Prefers moist, well-drained, acidic soil and full sun to part shade. A Knap Hill selection.